In June of this year, The Wealthy Dentist published a story about Taxpayers footing the bill for orthodontic braces in Texas. In Texas, Medicaid pays dentists for orthodontics per procedure, instead of a lump sum for the “finished mouth” of straight teeth. 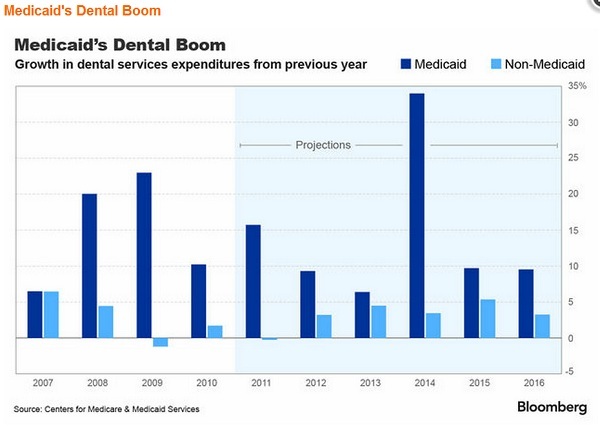 This has made Medicaid orthodontia a lucrative dental business in Texas. WFAA-TV of Texas has been investigating this story for the last six months and has uncovered hundreds of millions of dollars of questionable Medicaid spending on dental braces for children in Texas. Their news reports prompted federal investigators to now audit the Texas Health and Human Services Commission, which controls the Medicaid funds. In a letter to the state, the Inspector General says it will examine the “authorization process for orthodontic treatment” under Texas Medicaid. “The objective of our audit,” the letter continues, “is to review the State’s controls to ensure that only medically necessary orthodontic cases are paid.” The time period covered by the audit is September 1, 2008 through May 28, 2011. The new station’s investigation revealed that during that period, Texas taxpayers spent $424 million on orthodontic braces for children under Medicaid. Taxpayers spent $100 million in 2008, $140 million in 2009, and $184 million in 2010, state records show. Texas dentist, Dr. Christine Ellis, who teaches at UT Southwestern Medical Center, has twice traveled to Washington in an attempt to convince lawmakers to scale back Texas Medicaid orthodontics payments and divert funds for more pressing dental needs. Billy Millwee of the Texas Health and Human Services Commission is now telling WFAA-TV that if taxpayers money has been lost, the Attorney General might take action to get it back. He went on to say that Texas will have a new managed care Medicaid dental program beginning next spring. For more on this story see: Feds Investigate Texas Dental Medicaid Program and Taxpayers Footing the Bill for Braces in Texas. Straight teeth are hugely desirable in our culture, but who is the right doctor to straighten a dental patient’s teeth with braces? An orthodontist or a general dentist? The Wealthy Dentist conducted a survey that asked dentists what percentage of orthodontic patients they refer out. What are your thoughts on general dentists placing braces?